Offense? Defense? What we love is a utility player. A versatile player. A jack of all trades. One who can seemingly do it all on the football field. That’s how we feel about this spice rub in the YVF Kitchen. It works on so many cuts of chicken, adding a little spice, a little sweet, and a lot of flavour. Try it with skin-on drums or thighs. Give it a go on a whole oven-roasted chicken. And, of course, it’s a great choice for wings as well. 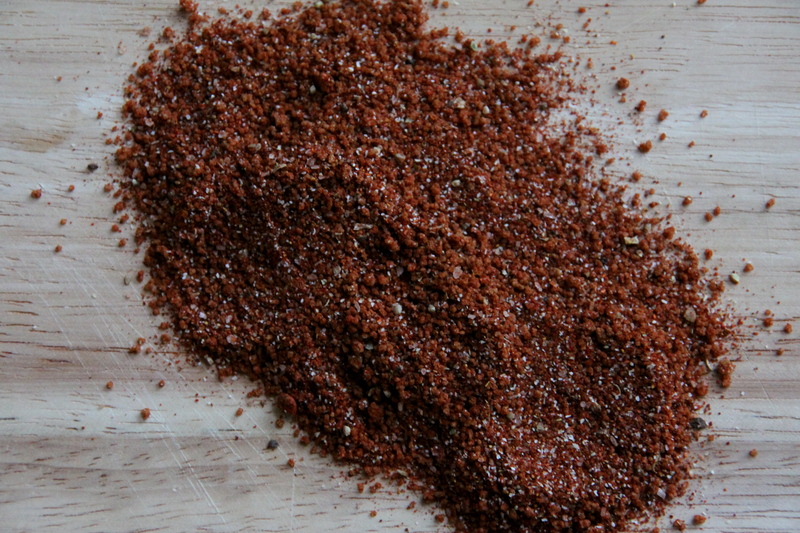 Here we present the YVF Kitchen MVP of spice rubs. Combine all ingredients and stir well until blended, breaking up any lumps of sugar. Game Day is almost here. According to the U.S. National Chicken Council’s 2014 Wing Report, 1.25 billion wings will be devoured during Super Bowl XLVIII on Sunday February 2, besting last year’s total by 20 million. That’s enough to put 572 wings on every seat in all 32 NFL stadiums! To help you prepare for your football festivities, all this week we’ll be sharing the best Game Day Grub ideas from the YVF Kitchen, as inspired by the YVF Home Office Team. We’re kicking things off with, well, what else…wings! Apparently 2014 marks the 50th anniversary of the first “Buffalo Wing” being sauced and tossed at the Anchor Bar in Buffalo, New York. In honour of this milestone birthday, and because Buffalo-style wings are a game day classic, the YVF Kitchen offers you this DIY recipe for oven-baked crispy wings with spicy Buffalo-style sauce. Combine dry ingredients in a plastic bag or medium-sized mixing bowl. Toss wings until coated. Transfer to a parchment paper lined baking sheet. Drizzle wings with melted butter. Using tongs, turn wings to coat with melted butter. Bake for 30 minutes. 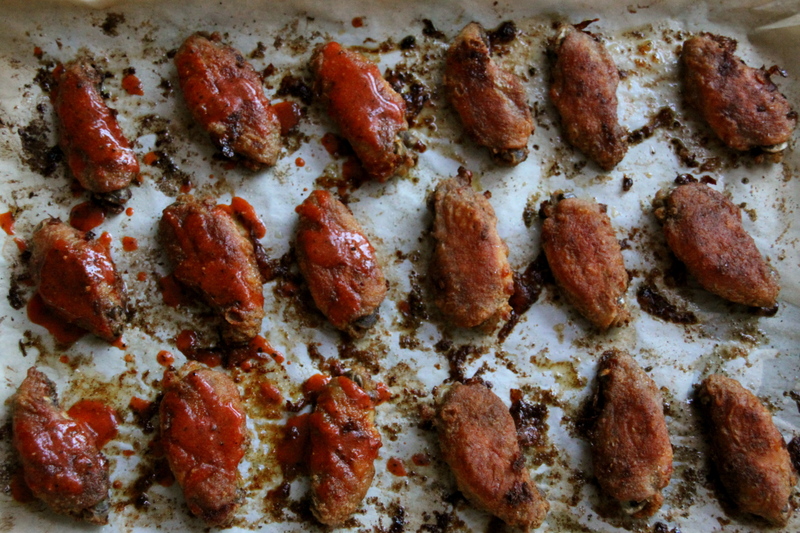 Flip wings over and bake for another 15 minutes. The wings should reach an internal temperature of 165°F (74°C). To make Spicy Buffalo-style Wings, coat with the sauce (recipe below) while warm and return to the oven for 5 more minutes. Melt butter. Add cayenne, garlic powder, black pepper and salt. Stir to combine. Remove from heat and add in the Cholula Original Hot Sauce. Stir until well blended. This sauce can be refrigerated for two days. Ensure the sauce is fully cooled before transferring for cold storage. At the YVF office, Alex, our Director of National Accounts, is often looking for gluten-free options, so in the YVF Kitchen we make up a batch of these wings using organic quinoa flour instead of all-purpose wheat flour. They are just as crispy. You can also substitute sunflower oil for the melted butter if you prefer. 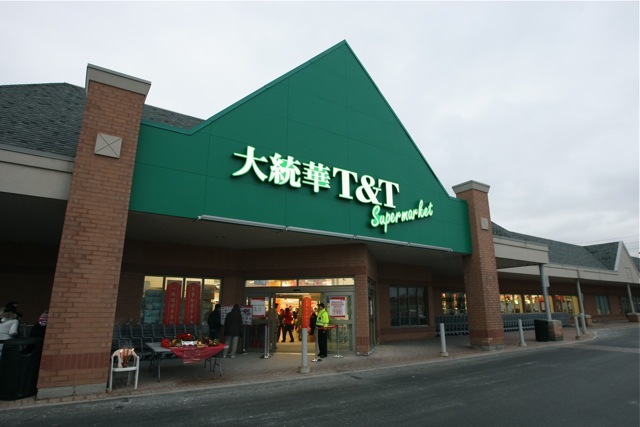 T&T Supermarket is Canada’s largest Asian supermarket chain, featuring a broad selection of uniquely Asian items not found at other grocers. You can shop for noodles from Taiwan, special sauces from Hong Kong, or unusual fruits from southeast Asia. 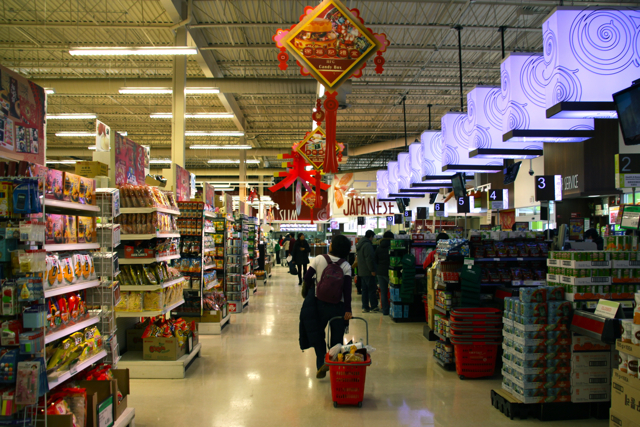 In additional, T&T offers an in-house bakery, an Asian deli, a Sushi bar, and a Chinese BBQ department. 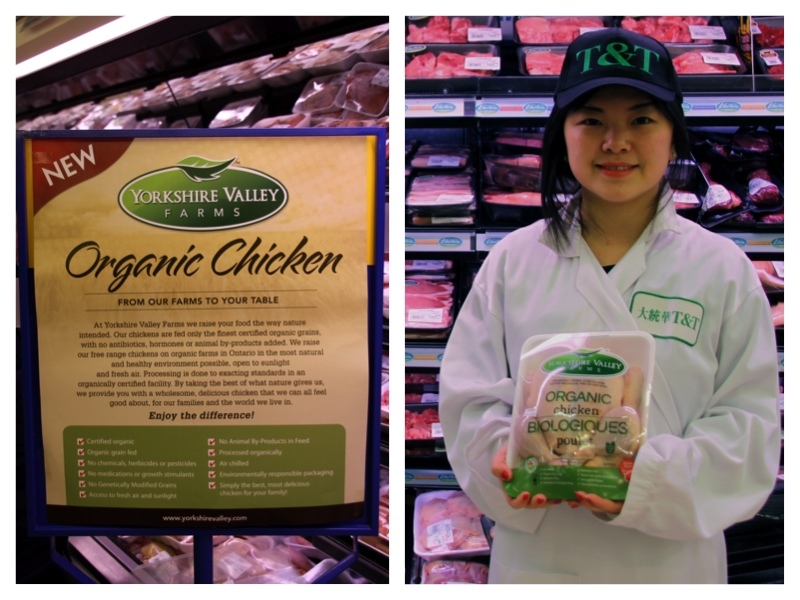 And starting this month, you can now also find Yorkshire Valley Farms fresh whole organic chicken at T&T stores across the GTA! Hanging out in store with the T&T team. Founded in 1993, T&T just celebrated its 20th anniversary. With 22 locations across Canada, and more in the works, there is much to celebrate. T&T’s commitment to quality and a high level of customer satisfaction has helped them to develop a loyal following, especially among Canadians looking for ingredients that allow them to make their favourite cultural dishes. This T&T store is decorated for Chinese New Year. We spoke with Abigail Lu, a member of the T&T head office team, about the importance of organic, her favourite chicken dish, and what we need to know about the upcoming Chinese New Year holiday. Through Abigail we learned a fun fact about the “T&T” name. We talked with Abigail about her favourite chicken dish. Like many of us, our fondest food memories involve family and enjoying a meal together at home. For Abigail, it is the chicken wings with Chinese black mushrooms that her grandma used to make for the family all the time. With Chinese New Year just a couple of weeks away, we asked Abigail to tell us about some New Year traditions. The New Year, or Spring Festival, is the most important event in the Lunar calendar and represents a time of prosperity, family, tradition and good will. Abigail also told us that “When cooking, people generally avoid chopping up fish, leafy greens and other items. In fact, using knives, cleavers or sharp objects during the holiday season is considered unlucky.” As with many traditional Chinese gatherings, food plays an important role. In fact, “Chi fan le mei you?”, “Have you eaten yet?” is a common greeting to guests as they enter a host’s home. T&T will be preparing special dishes for the New Year celebrations on January 31st, so visit the T&T website to learn more and begin preparing for your own New Year’s feast! To find a T&T store near you, check our Where to Buy page. T&T shared this popular recipe for Three Cups Chicken with us, so you can explore some new flavours in your own kitchen. 1. 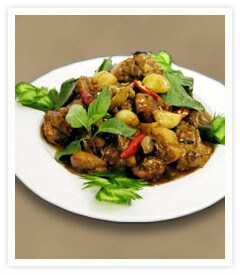 Cut chicken into small pieces and place them in boiling water for 2 minutes, drain and dry. 2. Cut green onions in short pieces. Lightly crush garlic and ginger. 3. Heat sesame oil in a pot. Add green onions, garlic, and ginger and bring to a boil. 4. Add chicken and soy sauce and stew for 2 minutes. 5. Add in rice wine and sugar and stew until the juice thickens. 6. Add basil when ready to serve. Preheat the oven to 400°F / 200°C. Trim and discard ￼3/8 inch / 1 cm off the top and tail of the orange and cut it into 12 wedges, keeping the skin on. Remove any seeds. Place the wedges in a small saucepan with the honey, saffron, vinegar, and just enough water to cover the orange wedges. Bring to a boil and simmer gently for about an hour. At the end you should be left with soft orange and about 3 tablespoons of thick syrup; add water during the cooking if the liquid gets very low. Use a food processor to blitz the orange and syrup into a smooth, runny paste; again, add a little water if needed. Mix the chicken breast with half the olive oil and plenty of salt and pepper and place on a very hot ridged griddle pan. Sear for about 2 minutes on each side to get clear char marks all over. Transfer to a roasting pan and place in the oven for 15 to 20 minutes, until just cooked. Once the chicken is cool enough to handle but still warm, tear it with your hands into rough, quite large pieces. Place in a large mixing bowl, pour over half the orange paste, and stir well. (The other half you can keep in the fridge for a few days. It would make a good addition to an herb salsa to serve with oily fish such as mackerel or salmon.) Add the remaining ingredients to the salad, including the rest of the olive oil, and toss gently. Taste, add salt and pepper, and, if needed, more olive oil and lemon juice. Excerpted from Jerusalem. 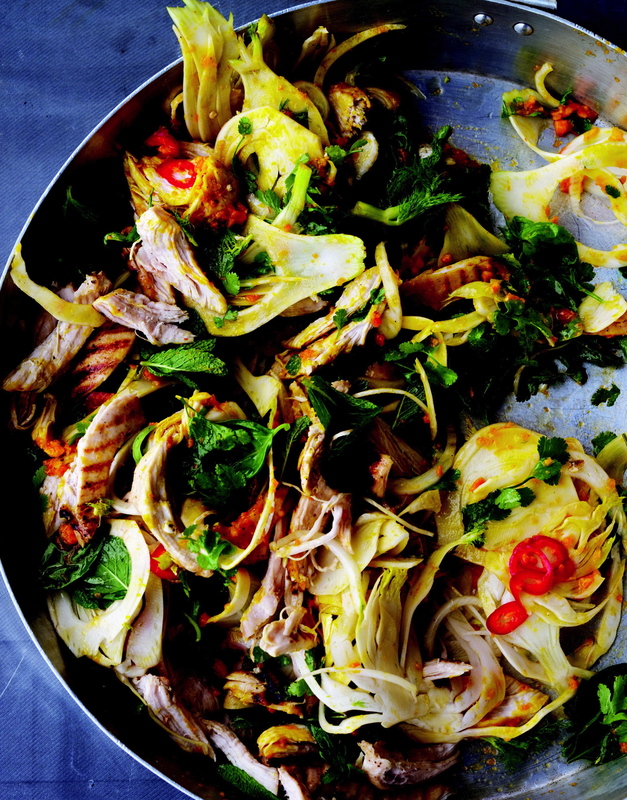 Copyright © 2012 Yotam Ottolenghi and Sami Tamimi. Published by Appetite by Random House, which is a division of Random House of Canada Limited. Reproduced by arrangement with the Publisher. All rights reserved. Cut the thighs into 1-inch pieces and place in a shallow dish. Make it beg for the sauce. 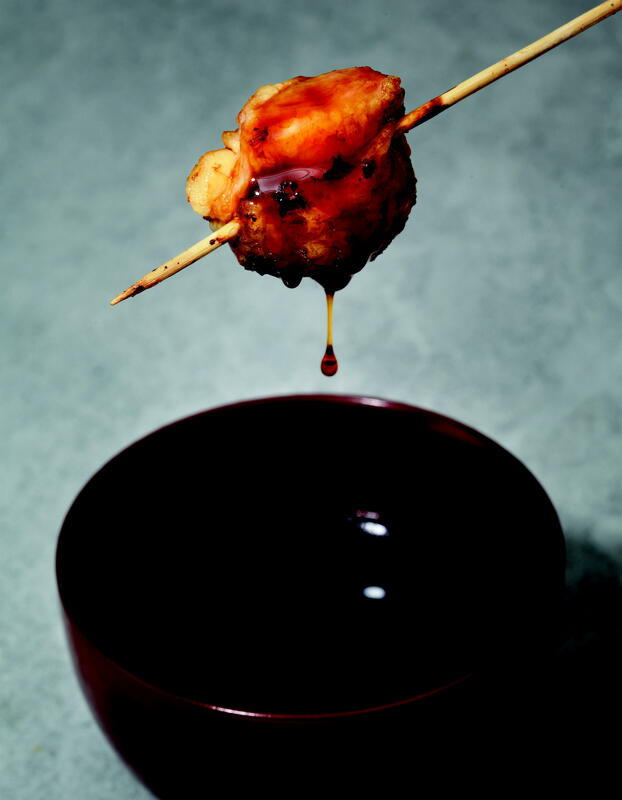 In a small saucepan, combine the soy sauce, mirin, sake or sherry, sugar, garlic, and ginger. Bring to a simmer and cook for about 7 minutes, until thickened and syrupy. Save 1/4 cup of the sauce for dipping and drizzling. When you think they deserve it, pour the remaining sauce over the thighs, cover, and chill for at least 1 hour and up to 4 hours. If using wooden or bamboo skewers, soak them in water for 1 hour. Preheat a grill or broiler. Thread the chicken pieces onto skewers and grill or broil, turning halfway, for about 6 minutes. Serve drizzled with the reserved sauce and showered with scallions. Excerpted from Fifty Shades of Chicken. Copyright © 2012 F.L. Fowler. Published by Clarkson Potter. Reproduced by arrangement with the Publisher. All rights reserved.